The leading issue with the majority of back care programs is limited treatment options. In addition to being highly addictive, pain medications mask problems, which often leads to additional damage because warning pain is not felt. Physical therapy is limited by what insurance companies deem necessary and the most excessive option, surgery, is very costly and often times ineffective. 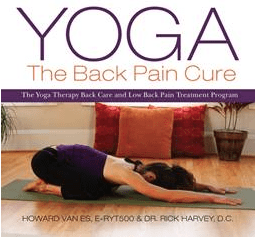 Introducing YOGA The Back Pain Cure by Howard Van Es & Dr. Rick Harvey; a highly experienced yoga instructor and chiropractor (respectively) who have been working together for over 7 years. The practices in YOGA The Back Pain Cure have treated thousands of people with back issues and have proven successful 93% of the time. YOGA The Back Pain Cure features two yoga therapy practices that effectively heal and prevent back pain without medicine, surgery or any other potentially risk inducing factors. It is a safe and cost effective alternative that treats the root of pain. Yoga therapy can help relieve pain while at the same time improve flexibility and strength. And because yoga is a practice that involves the mind and body, most people find they sleep better, their mood improves, and they enjoy an enhanced sense of well-being. With the help of YOGA The Back Pain Cure, back ache sufferers can resume activities and lifestyles they enjoy, without drugs or costly treatments, and from the comfort of your home. The World Almanac® and Book of Facts 2015 (Dec. 2; $13.99) chronicles the most notable people, places, and events of 2014 along with a wealth of fascinating facts. At more than 140 years old, this latest edition of America’s bestselling reference book offers details about technology, countries, movies, world records and more, as well as the return of popular sections like Time Capsule, Offbeat News Stories, Top News Topics and Year in Pictures. The LEGO MINDSTORMS EV3 system makes it easy for anyone to build and control robots. LEGO’s block-based and colorful EV3 programming language is great for first-timers, but it has more powerful features than its user-friendly interface might suggest. 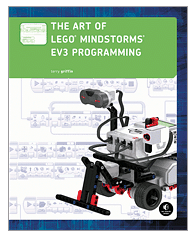 In the upcoming book The Art of LEGO® MINDSTORMS® EV3 Programming (No Starch Press, $34.95, 276 pp., Sept 2014, ISBN 9781593275686), software engineer Terry Griffin offers a beginner-friendly, in-depth guide to the EV3 language. An update to Griffin’s highly regarded Art of LEGO MINDSTORMS NXT-G Programming, this new book teaches readers the basic building blocks and then launches into more sophisticated programs. Readers begin by writing functions that control their robots’ movement, sensors, and sounds and then move on to programming more complex behaviors that allow their robots to follow lines, detect objects, and navigate mazes. The Art of LEGO MINDSTORMS EV3 Programming will be available in bookstores everywhere in September 2014. In THE FORMULA: How Algorithms Solve All Our Problems…And Create More, Fast Company and Wired writer Luke Dormehl digs deeper to figure out whether our increased reliance on algorithms makes our lives easier—or whether it creates more questions than answers. He interviewed mathematicians, artificial intelligence experts, and Silicon Valley entrepreneurs, and picked real-life examples to illustrate the concepts they discuss. Bestselling cookbook author Nancy S. Hughes’ new book, Diabetes Carb Control Cookbook, features 150 recipes with exactly 15 grams of carbohydrates each, making it an ideal choice for carb counters. This easy-fix, easy-to-follow cookbook is a great tool to help portion control and carb intake. The Diabetes Carb Control Cookbook makes mealtime math a thing of the past, combining a cookbook, meal planner, and carb counter into one seamless system. Each recipe is designed to provide 15 grams of carb per serving, and each chapter organizes foods based on type of dish. Readers looking for a side dish with 15 grams of carbs to round out dinner can go right to the appropriate section. With over 150 recipes covering breakfast, lunch, dinner, and desserts, as well as plenty of quick-fix or no-fix side suggestions, all designed to provide 15 grams of carbs, this book is a must-have for those living with diabetes and for anyone who wants to eat healthier and reduce carb intake. During recovery, most programs focus on the mental, emotional, and spiritual states. The Recovering Body (Hazelden, October 2014) by Pittsburgh author Jennifer Matesa, author of the popular blog Guinevere Gets Sober and guest on an upcoming episode of Second Opinion, airing in October on PBS, is a unique resource devoted to the repair and well-being of the physical body during sobriety. Each chapter discusses how exercise and activity, sleep and rest, nutrition, sexuality, and meditation all aid in physical recovery. Matesa also describes her battles with addiction and explains the methods she used to stay clean, based on solid science and practical guidance, as well as shares the experiences of others in long-term recovery. The Amazing Tennis Ball Back Pain Cure was written by Justin Price, creator of The BioMechanics Method® and one of the world’s top back pain experts is the ultimate guide to helping you overcome back pain. Unlike other books on back pain relief that require you to do dynamic stretching or strengthening exercises that can make the problem worse, The Amazing Tennis Ball Back Pain Cure provides you with simple techniques and soothing exercises that address the underlying cause of your pain and prepare your entire body to move without the constant discomfort that has become an unwanted part of your life. If you want to get rid of your back pain naturally and for good, you must address the two most prevalent causes of pain (overworked muscles and irritated joints) before you start putting your body under the stress of traditional exercises. Justin has spent more than 20 years helping people put an end to chronic pain with his easy, insightful, and intuitive tennis ball program and he has taught his remarkable techniques to other health professionals around the world who use them to successfully eliminate their patients’ muscle, joint, and back pain. Now his methods are available to you in this truly amazing book. Sells for $12.95. Call it the buddy system, because Baking with the Cake Boss is an education in the art of baking and decorating, from kneading to rolling, fondant to flowers, taught by Buddy Valastro himself, the star of TLC’s smash hit Cake Boss. With more than 100 of his most sought-after recipes, including birthday and holiday cakes and other special theme designs, this book is a master course that culminates in the showstopping cakes for which Carlo’s Bake Shop is famous. Bursting with delicious, tried-and-true recipes, how-to boxes and sidebars, and numerous tricks of the trade, Baking with the Cake Boss is a rare treat—a fun, accessible guide to baking, all in a gloriously designed, fully illustrated package worthy of the Cake Boss’s artistic vision. In this heartfelt memoir, master baker and star of the #1 hit TLC show, Buddy Valastro tells his inspiring story—and recounts his family’s warm memories from a lifetime of living, loving, and cake making. This is the incredible true story of how Carlo’s Bakery came to be, how one hard-working family realized their patriarch’s dream of making their beloved bake shop a household name. The special bond and loving dynamic of the Valastro clan make this an uncommonly touching and truly inspiring memoir. The Essential Cake Boss is a perfect slice of Buddy Valastro’s beloved bestseller Baking with the Cake Boss—a sweet collection of Buddy’s core recipes and techniques; the building blocks of Buddy’s show-stopping desserts; and many of his most popular, signature creations. You’ll learn to work with baking and decorating equipment, bake perfectly moist cupcakes and cakes, and work magical effects with frosting and fondant. Gorgeous photos let you follow Buddy as he shows how to create his artistic flourishes and decorations. The Essential Cake Boss also features charts that let you mix and match cake flavor, frosting, and liqueur syrup to create your own trademark cakes. Sylvia’s Table is a new cookbook by Great Performances CEO and founder, Liz Neumark. A great gift for moms, dads and kids alike, Sylvia’s Table is packed with over 200 recipes that the entire family will love to make and share. Liz wrote Sylvia’s Table to help re-establish a connection of coming together around food – while creating family memories along the way. In addition to her own recipes, the cookbook features stories and recipes from over two dozen of her cherished chef-friends including Alex Guarnaschelli, Eric Ripert, Michael Romano, Deborah Madison, Dan Barber and Michael Anthony. Inspired by Liz’s non-profit organization The Sylvia Center, which is a garden to table culinary program that teaches children how to establish healthy eating habits, Sylvia’s Table brings these lessons straight from the farm to your kitchen as each original recipe uses only the freshest seasonal ingredients. How about a stocking stuffer that stuffs the wallet? Learn the secrets to saving this holiday! In Create Your Own Money-Saving Adventure by Melea Politis Johnson, you get to pick what YOU want to learn. Not ready to dive into the world of coupons? That’s ok! You can learn about Price Matching, getting out of debt, raising your credit score or saving money on travel. At the end of each chapter, your choices will start to make you a money-saving master. You will get to pick and choose different adventures depending on your lifestyle, time and personal money goals. It’s the Ultimate Money-Saving Guide for everyone! The Family Handyman’s Complete DIY Manual is a great present and “must-have” reference guide for every home-owning man or woman. Suitable for beginners and experts, the Complete Do-It-Yourself Manual is written in an accessible, conversational tone for easy, user-friendly assistance with every DIY task. With all instructions and materials updated to address current electrical, plumbing and building codes, and revised to incorporate the very latest in materials, tools, and technology, this is the only reference book a homeowner will ever need to save time and money on renovations and repairs. The manual includes over 3,000 photos and detailed illustrations, step-by-step instructions reviewed by over 150 home improvement and DIY experts, storage solutions to rid constant clutter, and much more. Dr Kourosh Maddahi, DDS has been a pioneer in Cosmetic Dentistry for close to 3 decades, and now, with his new guide to the all-new sub-field of Anti-Aging Dentistry, he’s continued the trend. Dr Maddahi reveals in his first book ever; Anti-Aging Dentistry, Restoring Youth, One Smile at a Time, some of the great mysteries associated with aging in the lower 1/3 of the face, not just inside the mouth, but in the lips, cheeks, and jaw. He walks the reader through a step-by-step analysis of these largely misunderstood abnormalities that have been previously regarded as unfixable by medical or cosmetic procedures, and explains how it is expertly placed porcelain veneers and crowns that can rectify them, not injectables and facelifts. These revolutionary procedures have caught fire in the press and medical industries alike, and are now laid out for anyone to understand and gage the value of them, by the leader in the field. This clear, concise manual is just what the doctor ordered in the road to understanding what it is that changes our faces as we age, and how we can prevent or reverse what we’ve been told is inevitable; looking older. THE ADRENAL RESET DIET: Strategically Cycle Carbs and Proteins to Lose Weight, Balance Hormones, and Move from Stressed to Thriving by Naturopathic Medical Doctor Alan Christianson is the first scientifically sound, patient-tested weight-loss plan developed by a natural endocrinologist. Dr. Christianson heals readers in all stages of adrenal impairment – whether they be stressed, wired and tired, or crashed – and recent study participants on his plan halved their cortisol levels in just 30 days and lost an average of 9 pounds! We’re told marketing is hard. That it requires months of analysis, weeks of brainstorming, and years of consistent implementation. To succeed in marketing, you need the fortitude of General Patton, the genius of Don Draper, and the cash reserves of Warren Buffet. WRONG. One week. That’s all it takes for most small and medium-sized businesses to dramatically improve their marketing. And let’s face it, most business owners do very little marketing, and what they do is not particularly effective. Business owners often don’t know how to best market their company, or are too busy working to make time to promote it. What they don’t realize is that effective marketing doesn’t have to be complicated or time-consuming. Mark Satterfield’s The One-Week Marketing Plan lays out a step-by-step system entrepreneurs can put in place in just five business days. This “set it and forget it” strategy works all day, every day to bring in new business. Tailored to each company’s niche market, this innovative plan can generate a consistent stream of customers for an out-of-pocket expense of as little as $300.